That is what my uber picky particular Hubby said when he tasted these cupcakes. For those of you who don't know my Hubby or are new to the blog, that, my friends, is what I like to call a rave review! Because tasting like fall is a good thing. And he is absolutely right, these cupcakes do taste like fall. The flavors have all the goodness of fall, with apples, cinnamon and other warm spices along with a delicious buttery caramel flavor pulling it all together. Caramel Apple Cake was Melissa from the Lulu the Baker's pick for this week's Club: Baked baking assignment. And the timing couldn't be better coming right around Halloween. Who doesn't love a caramel apple? The recipe as written from Baked Explorations is a massive 3 layer cake that can be presented in a few impressive ways. 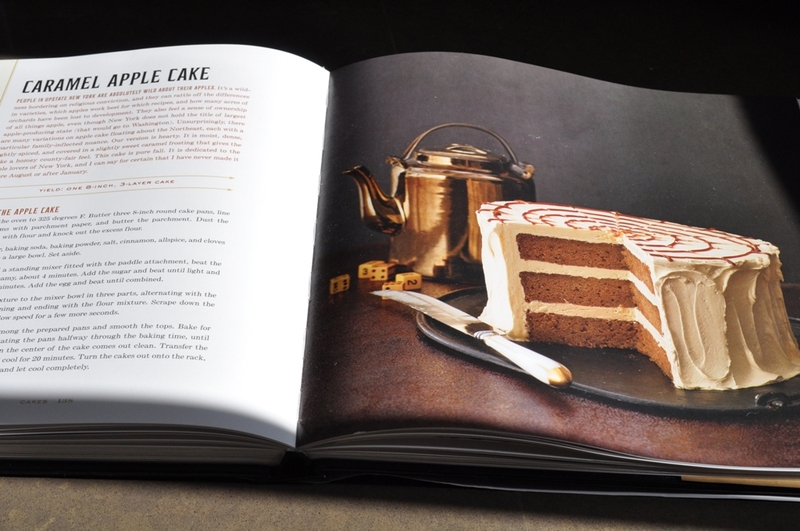 Below is a picture of how the cake appears in the book. I also came across this amazing presentation from the Great Cake Company. Jaime made the cake look like a giant caramel apple, stick included! You have to pop over to her site to see her gorgeous cake. It's really stunning. If you have a party to go to this fall, this cake would surely be a crowd pleaser. It would also make a nice addition to a Thanksgiving dessert round up. I live 2 doors down. Now, on to the cupcakes. Three components make up this tasty dessert. Apple spice cake. 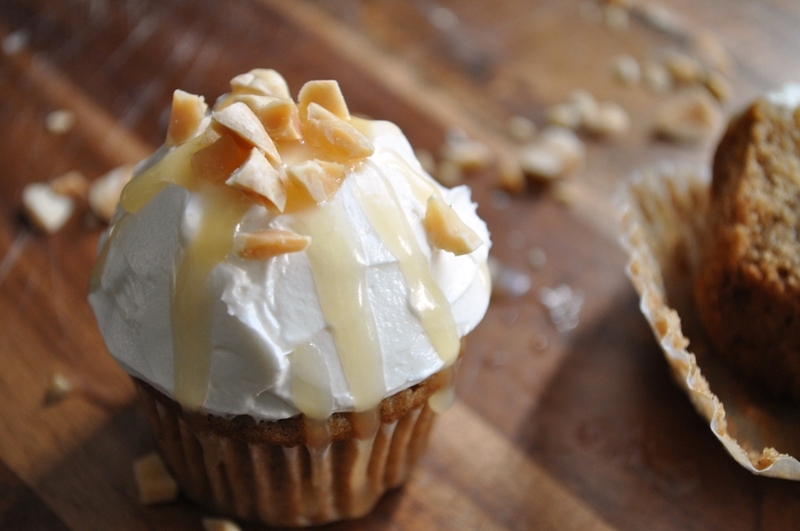 Caramel buttercream. Caramel sauce. 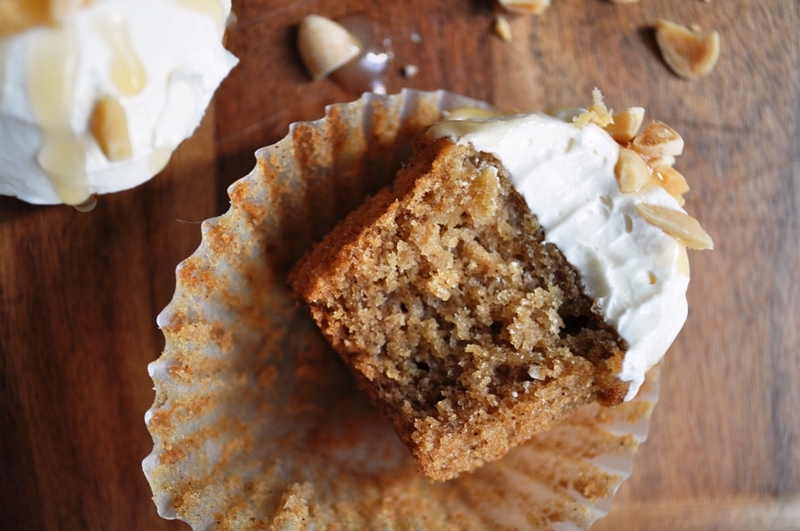 The apple spice cake is soft, light and moist and really delicious. It could stand all on it's own. With a simple apple glaze or even a dusting of powdered sugar and this would be a great cake (you could do 1/3 of the recipe to get an 8 inch cake). I do have one minor comment about the cake..the apple flavor seemed to fade a little bit the day after I baked it. The apple flavor was very pronounced, no mistaking, this is apple cake on day one. On day two, it was more like this is a really good spice cake...is there a hint of apple in there? I used store bought apple sauce, instead of making my own. I also substituted 1/2 cup (of the 2 cups) of the apple sauce, for homemade apple butter I had made the same day. I wonder if the spices in the apple butter were too much? I would have thought the apple butter would give it a more "apple-y" flavor. Next time I might use the applesauce recipe posted on the Great Cake Company blog as she mentions the use of boiled cider in her applesauce and that it gives an intense fresh apple flavor. There is also a recipe for homemade applesauce in Baked Explorations. The caramel sauce was pretty dreamy. I made the full recipe for this component figuring I might use the left overs to top ice cream. A few the other bakers in the group seemed to have issues with the sauce being a little on the thin side. I found it to be somewhat thin, but after sitting on the counter for an hour or so it thickened slightly and was just right. The only issue I had with the caramel sauce was one of my own doing. I tend to read through recipes quickly and that's what I did here. They recommend cooking the caramel until it is a rich amber color or you can wait until the mixture reaches 300 degrees on a candy thermometer. I just saw 300 degrees, so I took the sauce off the heat once it reached 300 and added the butter and cream. Then I realized that my caramel was very pale in color. I hadn't waited for it to take on the right color. So I threw it back on the flame and cooked for another 5 minutes or so and it gained a small amount of color. I didn't want to risk overcooking it, so I ended up with a pale caramel. Though pale, it's still super yummy. I think you could get away with reducing the butter by half in this recipe and still get a good result. Note, I'm saying that without actually having tried it. But I might try that next time. Lastly, there was caramel buttercream....this was like no frosting recipe I've ever made. It started with boiling a mixture of sugar, FLOUR, milk and cream until thickened. I would never imagine flour to be in frosting, but that's what I love about Club: Baked...learning new things. And this was a great thing to learn, because this frosting was awesome. It was smooth and silky with just the right amount of sweetness. I generally don't care for buttercreams because I find them to be overly sweet and buttery tasting. I'm all about butter, but I don't want my frosting to taste like butter. The trick to this frosting is patience. I had read in the P&Q that some bakers had trouble with the frosting and others suggested continuing to beat the frosting until it reached the desired consistency. So I took that into account when I made it. The boiled sugar, flour, milk cream mixture goes from the stove top to your stand mixer where you mix on high until the frosting cools. This took maybe 8 minutes or so....I kept feeling the outside of the bottom of the mixing bowl and when there was no more warmth, I moved on to adding the butter and caramel sauce. Then I let it beat for probably another 6-7 minutes. At first it seemed thin but, slowly, it became more and more fluffy and eventually resembled frosting! Really delicious frosting. I'm not going to lie, this cake is not a let's throw this together in a hour kind of cake. It's quite a bit of work and a lot dishes. But the result was absolutely worth the effort. You could make it a little more palatable by breaking up the work and making the caramel sauce the day before (as well as the applesauce, if you are doing homemade). This recipe is moving into the keeper file for certain. To get the recipe, head over to Lulu the Baker. Thanks for choosing such a fabulous recipe! To see how other Club: Baked bakers did with their cakes, click here. Your cupcakes are adorable and the photos are great! Your neighbor's girls are hilarious. Kids are too funny. YUM! I love cupcakes. The ratio of cake to frosting and toppings really make it the perfect bite. These are adorable and I love the nuts addition. Nice job girlfriend. And the neighbor conversation- hilarious. OMG wow Gloria once again I am dying of jealously looking at your cupcakes! haha They are stunning! Hahaha that little girl was hilarious. You mean you can't make little girls in the oven??? WHY NOT!? I flagged this recipe when I bought Baked Explorations, but I couldn't come up with an occasion to make that giant cake. I'm so glad you tested it out as cupcakes for me, now I'm definitely making it asap :) You never know what will come out of a kid's mouth, that conversation was too funny. I agree with super picky husband, they tasted like fall. Your cupcakes look delicious! My icing was a flop but they tasted wonderful. I agree, something I will make again. I definitely have to try the frosting again. I had one failed attempt and on my second, we lost power. Your cupcakes look great. I went with that too. Your cupcakes look delicious. The comments of the kids are too funny. I want one of your cupcakes for lunch. Seriously great job! Yeah, hurry up and make some daughters why don't you? LOL, love kids! 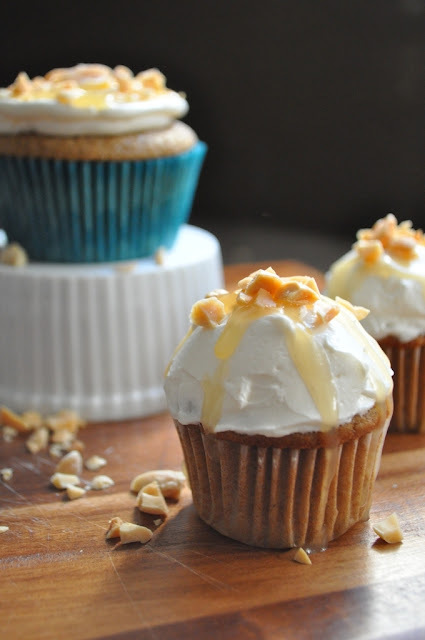 The cupcakes look incredible and very moist. Thank you for adding an email subscribe option-now I won't miss any more of your uber-fab posts! Cupcakes tend to solve problems with these big cakes that need an occasion of a huge family to make. Yours are adorable and make me hungry. Gorgeous apple cupcakes! Quite some time ago, I heard about a frosting with flour in it and I was skeptical. 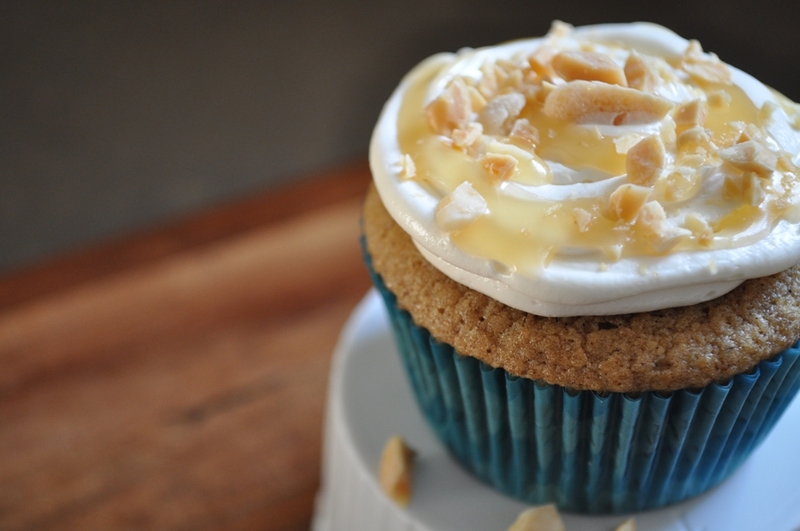 Like you, I tend to dislike butter cream frosting, so if this one is as good as you say...then I can't wait to try it!